Michigan native and pop-culture tastemaker, Tyler Oakley has gained more than 21 million social media followers through his humorous Youtube videos, high profile interviews, and social rights advocacy. After uploading his first video eight years ago, Oakley took the internet by storm. 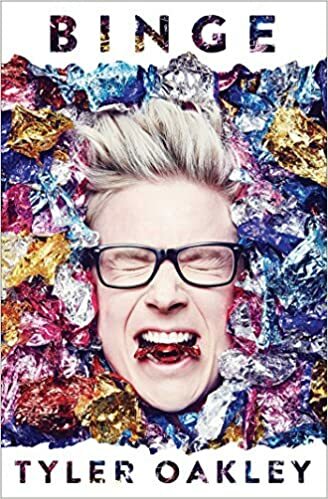 With success ranging from interviews with the First Lady Michelle Obama, boy band One Direction, a worldwide tour, and wildly popular podcast; Psychobabble, Tyler Oakley is an internet icon. In his first book Binge, Tyler delivers his best untold and hilarious moments. Reading “Binge” was a delight. I connected with the stories and with Oakley as if he was sitting here reading the book to me. His voice and his personality definitely shines through. I enjoyed each and every one of his stories containing many funny moments, and many sad ones as well. I was excited when he met One Direction and Michelle Obama and I felt his pain when he talked about his dark moments and his eating disorder. Tyler isn’t afraid to share anything and that is one of the greatest parts of the book. He doesn’t sugar coat his issues, or his mistakes, but owns them and learns from them.